My hats off to anybody who can weave Thomas Edison and Def Leppard into the same book! 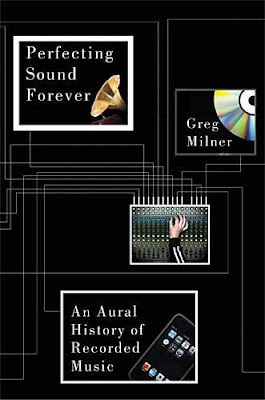 Greg Milner has done just that in his book Perfecting Sound Forever. This is the story of sound recording, from the early days with Edison (and others) when records were made on wax cylnders and Edison’s “Diamond” discs, right through the war over tape speeds, to early folk/blues recordings of Lead Belly, Bing Crosby’s involvement (you’ll be surprised), Les Paul’s self-perpetuated importance (which Milner puts into perspective), studios battling one another for prominence in the 50’s, Phil Spector and Joe Meek’s contributions, Led Zeppelin’s John Bonham and right on up to Def Leppard. A subject like this could be a very dry read indeed but Milner, who has written for Rolling Stone, Salon and Slate (and many others) knows how to keep us moving through his 371 pages of history. This is more a living breathing story of people then it is of hard facts, though Milner’s research is meticulous. Perfecting Sound Forever might just be the first thing you need to hear about the history of this most unusual, yet far reaching of subjects.